I’m not-so-secretly pretty excited about Autumn. While I’ve really loved this year's Summer, I still feel more comfortable in trench coats and scarves than bikini sets. Talk to me next February and I’ll probably deeply regret that statement, but right now am not afraid to face those colder Autumn days and everything related to it. Summer isn’t completely over yet but the Minnebelle HQ (read: the ironing board in my office at this moment) has been a display of Autumn makeup collections already. Guerlain’s collection Bloom Of Rose has been out for a month now and while the name would suggest a collection with only hues of pink, there’s a massive amount of blue to be found in this post. I never wear blue, but because the palette is so pretty.. I totes went for it! 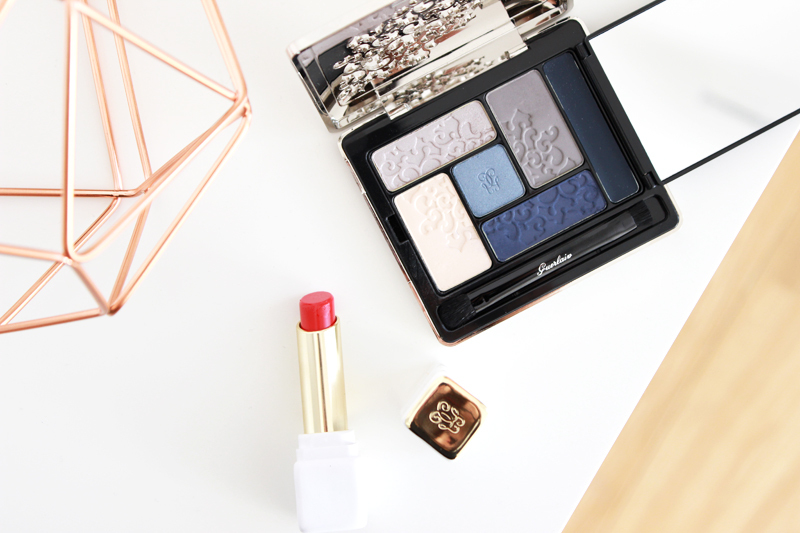 Lover of the blue eye make up look: read on. First off let's take a moment and check out the pretty packaging of the Guerlain Ecrin 6 Couleurs in Beaugrenelle. 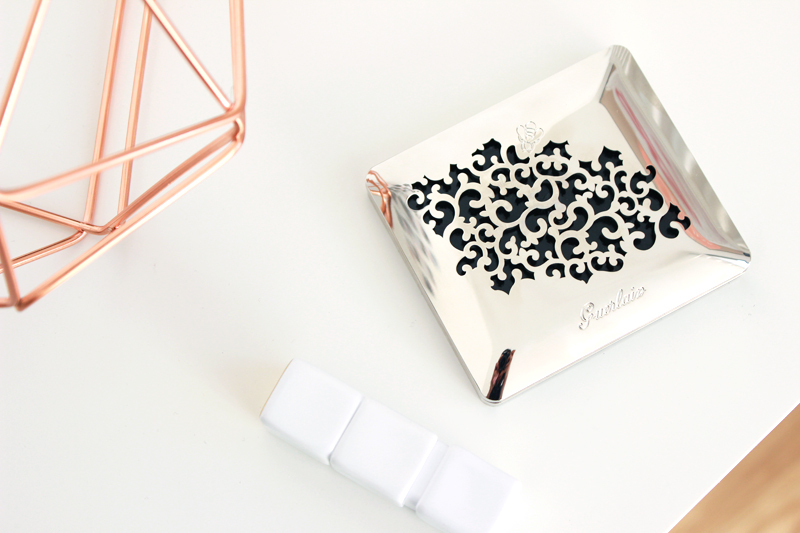 Guerlain knows how to seduce with pretty compacts and they went for it again this time. 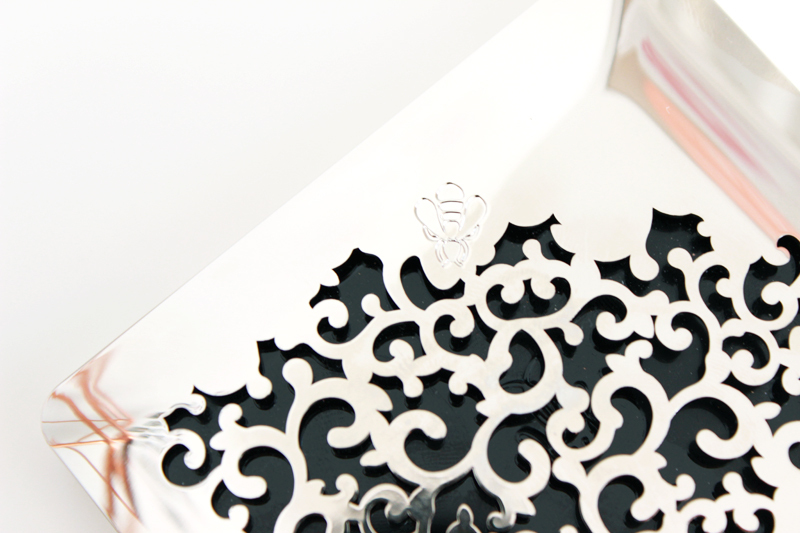 Let's hope they take this cut-out embossing thing further into future collections too! The Beaugrenelle palette contains 5 cool toned eyeshadows that vary from a beige to a silvery taupe and two shades of blue. On the right side of the palette you'll also find a dark blue liner. As my pal Sunny pointed out, it seems like Guerlain has changed their formula when they introduced new quads and singles earlier this year. The powder eyeshadows seem drier in texture in their latest collections & they tend to easily overblend. My first go with this palette using just a bit of primer wasn't spectacular. That said, I then gave the palette a second go with a heavy base (I used MAC's Soft Ochre paint pot) which made things a whole lot easier! I did still have to pack on the eyeshadow to get a good amount of pigmentation going on, so you'll need a bit of patience and a precise hand to achieve this look. I used all of the shades from the Beaugrenelle palette in this look, including the liner. The liner was a bit dry, but I ended up liking the messy application anyway as it intensifies the lash line. With this palette it's important not to blend out the shades too much as I found these to easily overblend, in which case you'll end up with a greyish blue shade all over the lid. While I do like how the look came out in the end (I love that inner corner highlight!) , I have to say it took some work. This is as dark as I could make it look on me - I feel like the darkest blue could've been a little more intense. I do think your eyeshadow base can make all the difference, as Annebeth has nothing but good comments about this palette and created a very pretty & intense look with it. It brings out the brown in her eyes beautifully! I didn't incorporate the red Kiss Kiss Roselip lipstick I got in this look - which has a pretty white packaging for the occasion - as it didn't fit with the blue eyes at all, but I do want to say that it has a beautiful and very hydrating formula. I'll try and feature it soon in a more appropriate look. The verdict? 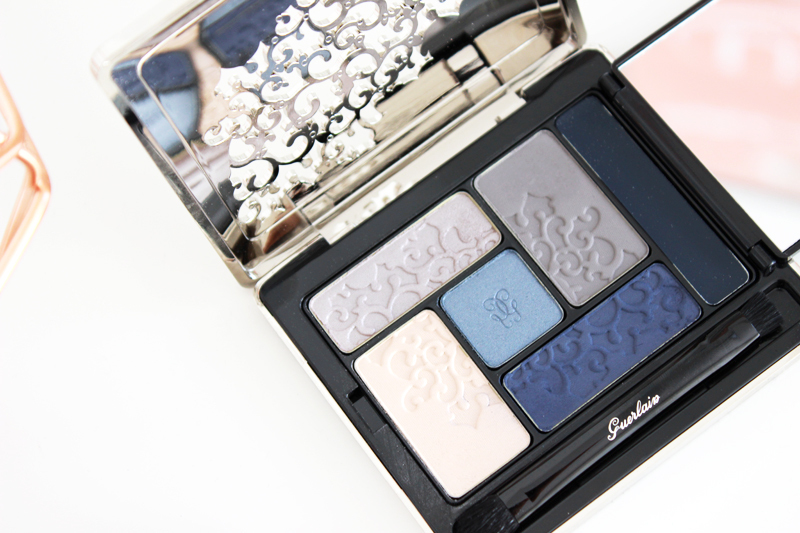 Guerlain's Beaugrenelle palette could be a nice addition to your makeup bag if you're into blues and greys, don't mind taking some extra time building up colour intensity (or if you're a fan of a subtle wash of colour) and if you're willing to splurge on special limited edition packaging. I'd personally just like a little more oomph in a palette with this kind of price tag. The lipsticks in this collection are really nice though, so if you're doubting between this palette or a couple of lip products I'd definitely choose the latter! There's also a limited edition nail base in this collection that I've been trying out - I'll give it a couple more uses and will report back asap.